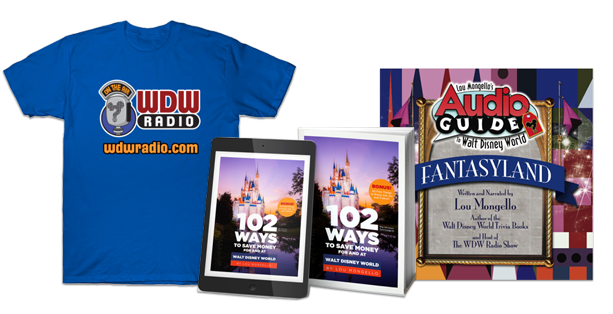 QUESTION for YOU from this week’s show: What is on YOUR “Disney Bucket List?” Share your thoughts in the comments below! COMPLETELY agree on the backstage tours (and with Timmy Foster on creating the magic for others – you go Timmy Foster!). So much of the magic, to me, is in the people that make it happen and how they go about it. There is no company in our history that does “people” better than Disney, and I love learning more about how they make it happen. Great show as always boys. 5flower and garden/food and whine. 7. Get back to WDW during the fall for Halloween (my birthday) and Food and Wine. Been a while. 9. Finish AND get published, my first book (which is Disney related), and pursue additional Disney related ideas I have dancing around in my head. I really want to (and am) doing this! 10. Meet Lou and chat. So many more. But I’ll leave it at that. Thanks again for another fantastic show, Lou and Tim!!! I would say, you were close in one of your recommendations about splurging and pampering yourself even just one night. But I’d say slightly more specific. Save, splurge, any way you can and book a Club Level room even if just one night. If you take a 7 night trip and need to make it 6 or 5 to do club level, so be it. There is no other way to stay on Disney Property that comes close to giving you the Disney “magic” or “pixie dust” feeling that you get with a Club level stay. Could be at a number of resorts or ways. From Contemporary 14th floor with MK view. To AKL and an exclusive tour available only to AKL club level. Choose which fits your style best but do it at least once. Will make that trip one of the most magical you ever take. Wow lunch with an Imagineer that is a really cool event!! Definitely looking into that one. Regarding the experiences, I had an interesting conversation with our Jungle Trek experience guides. They wanted to know how I found out about it. Of course, I told them I found out through “Lou Mongello” and had to dig for it in the app. They need to promote these more prominently because obviously they are hidden. Ok…. I loved this episode and it got my wheels turning on my Top Ten Things…. 9. Coffee and pastries in France at 10am before all the world showcase opens. Very few people are there very relaxing. 8. Riding Astro Obiters at night (and if you can time it) during Wishes fireworks. 7. Any bench in the World Showcase with a unique beverage of choice that you cannot find anywhere else. 4. Dinner at San Angel Inn during Illuminations (window seat a must). 3. A pint (or other) at the Rose and the Crown and enjoy the visitors. Looking forward to the Keys to the Kingdom Tour when I go in September. That was my Fathers Day gift from the wife and daughter. – The longer tour was a bit out of budget. Those two extra hours are expensive. I would love to do the lunch with an Imagineer – so that is on my future list. And I might see if I can work in a hair cut in September and perhaps be the last to leave. This was a fun show today. I have two that I would one, one of which I have done and one of which I have not. The one I have done and think everyone should do at least once is take a “Land and Sea” vacation- that is go on a Disney cruise followed immediately by a trip to the Kingdom (or vice versa). My wife and I did this last year (Christmas time too boot!) and it was one of my favorite trips. The one I have not yet done is getting a VIP tour guide. The price is very high admittedly but I think it would be a lot of fun to have a personal guide for a little bit of my trip. Just listening to your Bucket List Episode… We were Breathless Junkies! She was actually a 1930’s replica Teak Chris Craft. The first Breathless went down for repairs, which became too costly to complete. Then they added Breathless II. We were always amazed that Breathless never got the attention she deserved. Not only was She a Gorgeous machine, but you were able to experience a glimpse what she could do in experienced & loving hands. In a selfish way, I am glad we could hop a 20 min. Burst almost every time with no wait, but I do lament that so many people missed her while she was there. Our Breathless rides our in that handful of Best Day Ever’s at WDW. I’m so incredibly lucky that I have been able to do so much at WDW since we bought DVC! I’ve been there more times than I can count since 2007. I’ve done pretty much everything on the Top Ten and Then Some List, except I’ve never been the last one out of the MK. We have been the last ones out of HS, having had a very late dinner at the Brown Derby. We were escorted out by Security! Felt like VIPs! We were married at the Wilderness Lodge in 2005 and for the week we were there I planned as many surprises for my husband as I could, all things we had never done before. That week alone we did The Richard Petty Driving Experience (Well, he did since it was my wedding gift to him, DiveQuest, the Segway tour at Epcot, took the Breathless for a spin, did the Backstage Safari tour at AK, had our wedding day dinner at Hoop-De-Do, where they sat us right in front and stopped the show many times to ask why we were THERE on our wedding night (so much fun!). Other things we’ve done since then: Keys To The Kingdom Tour, Characters in Flight, Wild Africa Trek, parasailing at the CR, rented pontoon boats, pretty much every RunDisney event, horseback riding at TriCircle D, surfing at Typhoon Lagoon, Cirque de Soleil, Wishes cruise. I feel so lucky to have done so much! But the one thing I did want to share with everyone is I HIGHLY recommend taking a solo trip now and then. Most trips have been with my husband but I’ve taken many “girlfriend trips” and many solo trips, including one year doing a Christmas trip alone. Trips with family and friends are wonderful, but so are solo trips. Being a woman alone was never a problem at WDW. (Of course, WDW doesn’t exist in a bubble, so ladies always be careful!) But some of my best memories and greatest experiences have been solo. I highly recommend it! 10. Watching our newest family member’s face light up as HE experiences WDW for the first time (hewill be almost 3 when we go next). I would like to combine one of Tim Foster’s Must Do’s with one of Lou’s. Lou, you said you should celebrate something in the parks and Tim, you said you should help provide the magic for someone else’s vacation. As a guest to the parks and not a Cast Member, I keep a weather eye out for other guests wearing celebration pins and I can’t tell you how many times I have wished a total stranger a happy birthday or congratulated a couple on an anniversary. Oh sure, it’s fun when the cast members do it, but to me it feels like it’s a part of their job. Yet when total strangers with no obligation what so ever do it, it tends to mean a little bit more. It’s almost as fun as pin trading and I highly recommend everyone try it, at least once. 5. KISS GOODNIGHT AT M.K. 10. MEET UP WITH LOU AT SOME FANTASTIC RESTAURANT AND BE INVOLVED IN A PODCAST!!!! I’m surprised there aren’t more food options listed here. My family’s favorite thing to do is watch the fireworks from the Main Street train station, and then grab a bucket of popcorn on our way out. If any of you haven’t done it, I would highly recommend doing the parasailing over on Bay Lake. You can see for miles and it is so beautiful. Thrilling too! My son and I did a tandem harness and it was so cool to experience that together. You gotta do it at least once!!! For me, I’d like to dine with an Imagineer. “Hide my bacon when Piglet walks by” LOLOLOL I’m dying. Having a great time working my way through your podcasts! Thanks! 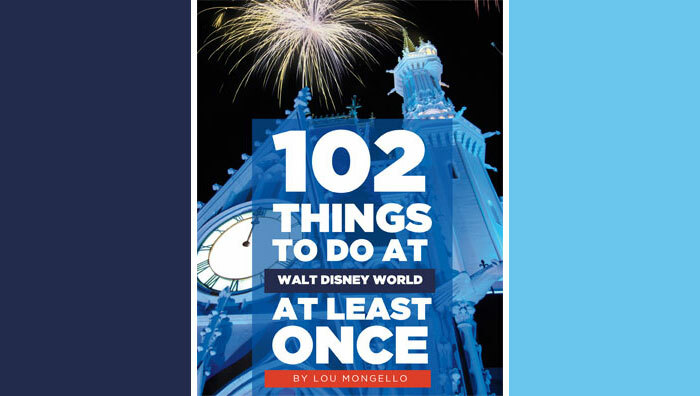 This is easy – a Lou Mongello tour of where and what to eat at Disney World.